Your Maestro instrument was built in a humidity-controlled workshop with a Relative Humidity of 45% to 55% to ensure that it is able to adapt to humidity and climatic changes when proper measures are taken. 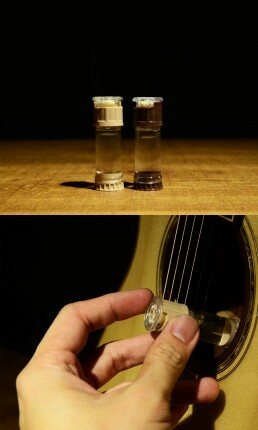 It is ideal to store your instrument within the same range of Relative Humidity to prevent the unwanted effects of humidity to your instrument. Effects of exposure to extreme humidity accounts for most of instrument repairs. Aside from being costly, the effects of such damages might be irreversible. Wood is hygroscopic in nature. It absorbs and releases moisture depending on the humidity levels prevalent in the environment. Though your instrument is made in a humidity-controlled environment, the wood will continue to release and absorb moisture regardless of age, material, and build quality, causing the wood to shrink or expand. Effects of exposure to extreme humidity accounts for most of instrument repairs. Aside from being costly, the effects of such damages might be irreversible. Relative Humidity is the prevailing degree of moisture held in the atmosphere relative to the temperature. The higher the temperature, the more moisture there is in the atmosphere. The lower the temperature, the less moisture there is in the atmosphere. The wood being hygroscopic, will absorb moisture when the RH is high for there is a lot of moisture in the atmosphere. On the other hand, the wood will release moisture when the RH is low for there is less moisture in the atmosphere. These humidity changes may cause the wood of your guitar to expand and contract as it releases and absorbs moisture. The initial step in protecting your instrument from humidity-related damages is by using hygrometers, a tool detecting the humidity level. Bloating of the soundboard causing the bridge to lift, and in extreme cases, the bridge pops out. High string action making the instrument hard to play. Loose braces which causes buzzing noise in the body and weakening of structural strength. Oxidation of metal parts such as machine heads, strap pins, and strings. 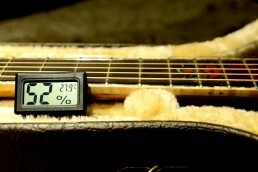 Store your instrument in an environment with RH between 45% to 55%. Storing your instrument in an air-conditioned room is ideal for it is a controlled environment. You do not have to keep the air-conditioning unit running the entire day, turning the air-con a few hours a day might be sufficient. Store your instrument away from wet areas such as bathrooms, piping, and windows. Use dehumidifiers to maintain the humidity level in your room to the ideal levels. It is worth investing to electric dehumidifiers when your place is very humid. If you are keeping your instrument inside a case for an extended period, place dehumidifying packs inside the case such as silica gels. Periodically check your instrument to ensure that it is not taking in unwarranted moisture and if there is a need to replace the dehumidifying packs. In case your instrument is showing signs that it has absorbed so much moisture, immediately loosen the strings and dehumidify it. If possible, send it to the nearest Maestro Dealer or technician for dehumidification. TOP | You can use a ruler to check if soundboard is bloating. It is normal to have a slight curvature on the top. 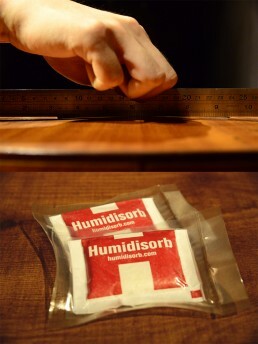 Use a packet of Humidisorb to absorb excessive moisture. RIGHT | When in a dry climate, use Humistat to ensure your instrument has the right moisture level. Fret ends are popping out caused by the shrinking of the fingerboard. Buzzing at the fingerboard caused by the soundboard caving in. Wood cracks and deformation causing loose glue joints and structural damage. In case you are transporting your instrument to a place with a very low humidity, let your instrument acclimatize first by keeping it in the case for a few hours. Place a humidifier inside your instrument, such as Humistat, to introduce moisture in your instrument, especially when you are keeping your instrument in a case for an extended period. In case your instrument is showing signs that it has lost a lot of moisture, immediately loosen the strings and humidify it. If possible, send it to the nearest Maestro Dealer or technician to prevent further structural damage.